The flywheel accepts one half of the load of the clutch system. 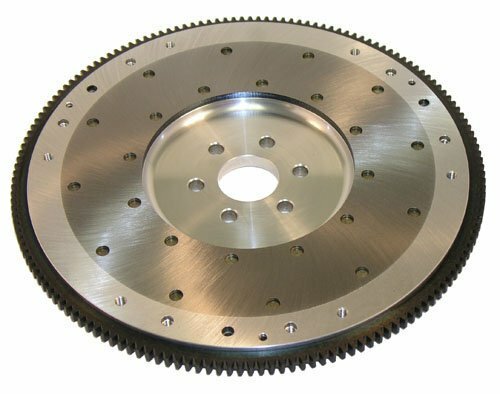 To realize the potential of the clutch system, the flywheel must be flat, parallel to the crankshaft flange, properly surface ground for maximum friction compatibility with the clutch disc, and balanced. Dyno testing proves that flywheel balance is critical to achieving maximum engine service. Every RAM flywheel is dynamically balanced to within ? ounce/inch of the factory specification. RAM aluminum flywheels have a .250 inch thick steel friction insert to handle the heat generated under extreme conditions, while allowing resurfacing without the need to replace the insert. All RAM flywheels are manufactured from SFI certified materials in our South Carolina facility. If you have any questions about this product by Ram Clutches, contact us by completing and submitting the form below. If you are looking for a specif part number, please include it with your message.